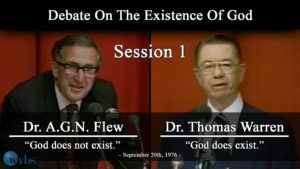 In this well-known debate onthe existence of God, two leading experts in the field of philosophy, Thomas B. Warren and Antony Flew, were brought together on the campus of North Texas State University. 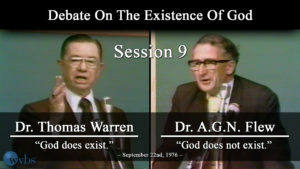 In this first session, the proposition of “I know that God does not exist” is presented in the affirmative by Dr. Flew with rebuttal by Dr. Warren. 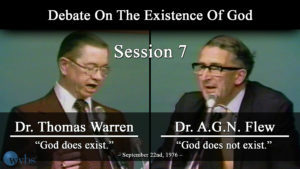 In this second session of the Warren-Flew debate, Dr. Flew presents a further argument for his atheistic beliefs, while Dr. Warren presents his rebuttal. 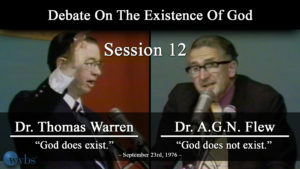 In this third session of the Warren-Flew debate, Dr. Flew presents what he calls “positive” reasons to be an atheist. 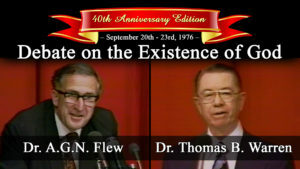 Dr. Flew and Dr. Warren also speak on the topics of values and the origin of man. 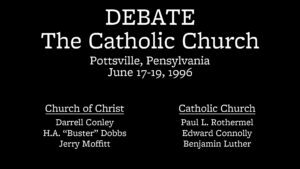 In this fourth session of the Warren-Flew debate, Dr. Flew elaborates more on how he thinks we get a value system and also discusses why he is an atheist. 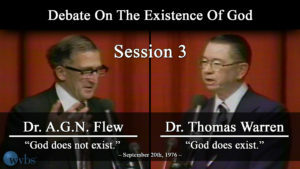 In Dr. Warren’s rebuttal, he discusses further why Dr. Flew cannot establish his case for God not existing. 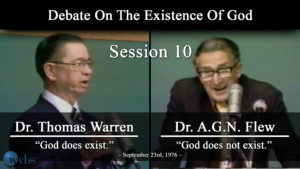 In this fifth session of the Warren-Flew debate, Dr. Flew discusses his thoughts on why a loving God would send His creation to Hell. He also presents his beliefs for proof against God. 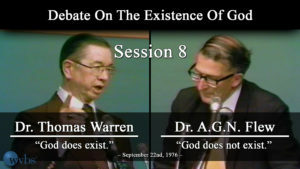 Dr. Warren presents a rebuttal for these arguments. 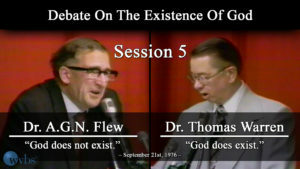 In this sixth session of the Warren-Flew debate, Dr. Flew discusses further reasons for his disbelief in God. 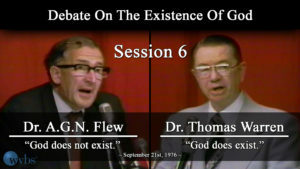 In this eighth session of the Warren-Flew debate, Dr. Warren further examines faults in Dr. Flew’s arguments and gives further reasoning for why God does exist. 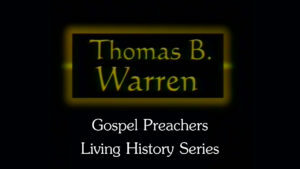 In this ninth session of the Warren-Flew debate, Dr. Warren discusses several of Dr. Flew’s arguments from previous sessions and presents his reasonings for why they are incorrect. 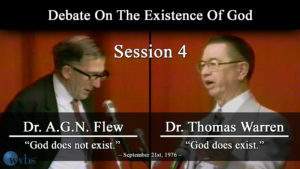 In Dr. Flew’s rebuttal arguments, he elaborates on why he believes in atheism. 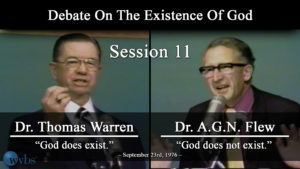 In this eleventh session of the Warren-Flew debate, Dr. Warren discusses the existence of God based on our observations of the world around us, especially in the human body. 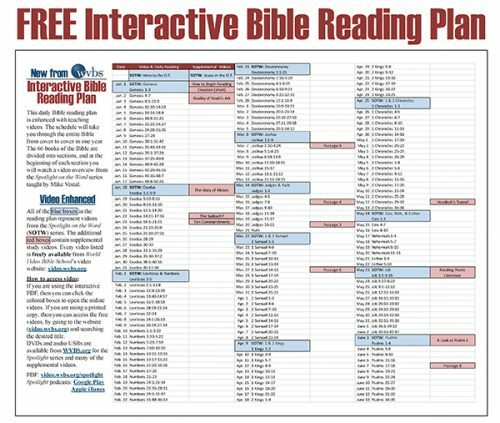 Dr. Flew makes claims “that your God is too small” and could not have created the Universe. 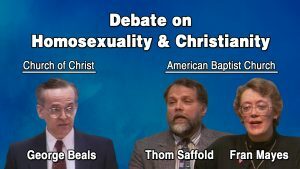 He also discusses how he feels the fossil record proves evolution. In this twelfth and last session of the Warren-Flew debate, Dr. Warren looks again at the origins of morality and values. He contends that the basis of right and wrong comes from a Divine Being. 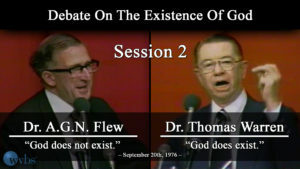 Dr. Flew gives his final arguments for his atheistic views.